Hi friends of the solar power!!! Kenny V. is typing…actually if my teacher Marco gets to know that I am called this way, he would feel a bit disappointed…but sounds good anyway no?? Nice to see the sunrise…made a huge effort trying to open my eyes…but it was worth it!! This morning (semi) Italian breakfast…I got coffee’s for everyone and butter CORNETTO also called in a more fancy way croissant..mmmm!! The car is charging..Lora and I are playing POI!! Rain sun sun rain rain sun …ok let’s go!!! We leave the parking at around 9.30. Destination Washington DC…500 miles…we’ll never make it!!! But we got to get there for the presentation!! Last chance is to carry the solar car into the van and drive to Washington, clearly later we have to come back where we left!! Don’t mess with the record breaker solar car ehhh!!! We stop after a some time..a policeman wanted to check and possibly take pictures of the car. No problem then! !Amazing..there is a wireless connection in the area…Thanks RENEE! !...all the members of the solar team start connecting to the internet, like water in the desert…I am thinking about how much internet influenced our lives…crazy dependency ehh! !..there is also a guy which seems extremely enthusiastic about the car, we also get a bottle of wine from him…un buon Pinot Grigio delle Dolomiti! Renee is gone, connection interrupted!! !Time to go guys! !I help Marcelo entering the car Lora again driving…Josh is become the contact person…he contacted the Brasilian ambassy in Washington, the press, the media…luckily Obama’s office closes at 5 p.m. otherwise he was going to call him personally. I am working on the presentation and I am quite satisfied…years and years of engineering…I got more or less the skills of making a presentation. I want my work here to be useful for someone!!! Teach someone something new!!! A car gets close to the van and asks for an interview with Marcelo…why not?..pull over!…Write the stop on log book.. Blocks for the car..camera help Marcelo getting out!! Ok! !In the meantime Josh alredy contacted half North America…he’s doing a really good job...and he is extremely diplomatic on the phone!!! Kenny V. the navigator back on board. Next stop another interview already 151 miles not bad!! Got some shots!!! We are going to be on the local television tonight!! My singlet does not result too professional I must confess!! Back in the street. Drive until the battery is low enough to personally ask to stop and here it comes: the ice-cream, fueling charging, consolation time…I am impressed by the good ice-cream. And the taste is further improved by the jam session topping…Ukulele-saxophone in the field…man! !Josh is getting better and better with that tiny guitar!! Leave the station and drive until there is still a bit of day light and elegant maneuver: Solar car inside the trailer, remove all the stuff from the trailer place the car extremely precisely and carefully and put back the things in the van!! Man that was strange!! !But ok done!! !now just a long breath to Washington!! Marcelo is driving, I am in the front with him writing this update Marcelo is driving, I am in the front with him writing this update and discussing about…choices!! We all need a power nap…45 minutes at gas station..and here we are again!! !Josh is driving we are typing…Lora sleeps. I will see you all tomorrow in DC, officially the today’s update is in evolution…and our long today already merged with our early tomorrow. After a morning charging the array, we were ready to head towards our nation’s capitol. We drove from South Carolina up through Georgetown, S.C. We were stopped by a local reporter at a local liquor store. A man named Tom was incredibly supportive of the project. He offered his house up for lodging for us. We got a local new story on the car, and I got a call from ABC’s 20/20! They also gave me a Jagermeister pump because I had a Jagermeister shirt on. After a quick stop, we headed up through North Carolina. Passing by Pawlie’s Island, we were pulled over by local news reporters for TV33. Up in Myrtle Beach, we had a TV interview at a local NBC station. At a gas station stop in fields of grass, Valerio and I jammed out the brand new “Solar Car Blues” with reckless abandon. After a brief stop, we drove until dark, landing in Leeland. We then packed up the solar car, and headed towards D.C. The crew took turns driving until we all eventually needed to sleep around 1:00 AM. We then switched drivers a couple times until we finally made it through Virginia. It was very foggy in the early morning, and we had to drive carefully. Georgetown. I’m happy we are still among southern accents and smiles. could have used a good swim back in Myrtle Beach, but we are on a tight schedule. Last night after dinner and the impromptu parking lot party we had attempted to park at the coast and sleep on the beach. We were so close to the ocean I could smell it...but onward and upward to the capitol! 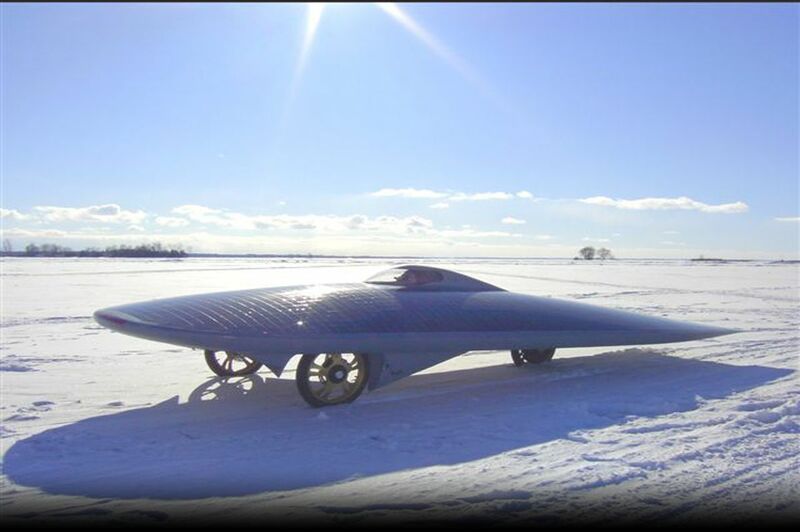 perfect time for the solar car to be out and about, generating excitement and promoting sustainable renewable energy! After we finish our ice cream cones we head back across the street to the van and the solar car. Josh and Valerio get out their instruments and in the setting sun among wild blackberries play the solar car blues. Valerio blows us away on the saxophone and Josh strums the ukulele with passion, and I shoot some good photos for the website. Before we hop back in the van Valerio hands me a fresh picked blackberry, yum! We drive on and end up going in a bit of a circle getting on and off HWY 17 but end up on a narrow neighborhood street. We pass kids practicing baseball, a family on the porch, two girls walking on the sidewalk, all shocked by a solar car driving by; a unique and rare opportunity to see history in the making. jeep turned around getting only halfway after four flat tires, and a motorcyclist had to be airlifted out after crashing and breaking his wrist, and the below freezing temperatures and the rain...I still want to go, to follow the solar car to the arctic circle. I can’t imagine a better adventure than this! Valerio discover a new specie of ants, "jelly ants"
A new vegetarian version of Edward Sizer hands, our own "Valerio carrot hands"
Making new friends, Thomaz a local motorized bycicle fabricator was thrilled to see te solar car and meet the crew. Great meeting you too! Say "solar car" you are on the solar car team camera! Josh and Robert Blomquist (ABC News). The interview will air tonight! Mirrow, mirrow, what do you see? While pulling over in Brunswick, the local Sherif follows the solar car to take a close look, holar! XOF1 inside the trailer,mpacked and ready to go. Washington ere we come!!! !